1 The National Cyclopaedia of American Biography, Volume 09, New York: James T. White and Company (1907), 396, Google Books (Digital Library). 2 Putnam, Eben, The Holden Genealogy: Ancestry and Descendants of Richard and Justinian Holden and of Randall Holden, Volume 1, Cambridge: Press of The Murray Printing Company (1923), 382, Internet Archive (Digital Library). 3 Roberts, Gary Boyd, Notable Kin, Volume 1 , Santa Clarita, California: Carl Boyer, 3rd (1998), 215. 4 Roelker, William Greene, Benjamin Franklin and Catharine Ray Greene: Their Correspondence 1755-1790, Philadelphia: American Philosophical Society (1949), 30, Internet Archive (Digital Library). 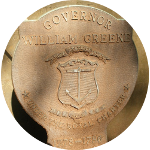 5 Wikipedia, "William Greene (colonial governor)", (accessed 12/02/2014).